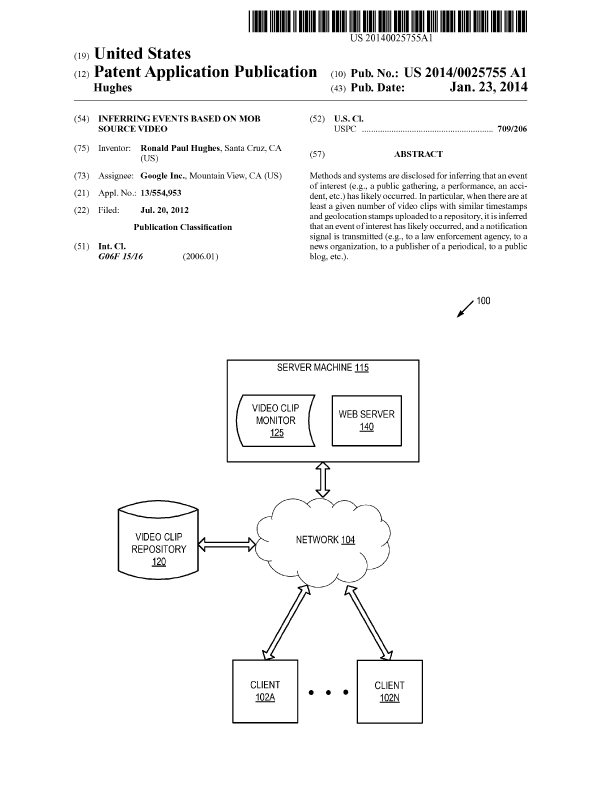 The following Google patent published January 23, 2014 details a method of determining whether a number of online videos of an “event of interest” are connected based on inferences made from timestamps and geolocation data. The patent then describes how the system could be set up to automatically notify a selected source, for example law enforcement, that the event is occurring. Methods and systems are disclosed for inferring that an event of interest (e.g., a public gathering, a performance, an accident, etc.) has likely occurred. In particular, when there are at least a given number of video clips with similar timestamps and geolocation stamps uploaded to a repository, it is inferred that an event of interest has likely occurred, and a notification signal is transmitted (e.g., to a law enforcement agency, to a news organization, to a publisher of a periodical, to a public blog, etc.). In an embodiment of the present invention, a computer system infers that an event of interest (e.g., a public gathering, a performance, an accident, etc.) has likely occurred when there are at least a given number of video clips with similar timestamps and geolocation stamps uploaded to a repository. The computer system, in response to the inference, transmits a notification (e.g., to a law enforcement agency, to a news organization, to a publisher of a periodical, to a public blog, etc.) that indicates the likely occurrence of an event, as well as a time and geolocation associated with the event. Embodiments of the present invention take advantage of the fact that wireless terminals (e.g., smartphones, etc.) may have geolocation capabilities such as Global Positioning System [GPS] receivers, location estimation via WiFi hotspots, etc., and may assign timestamps and geolocation stamps to video clips recorded by the terminal. In particular, methods and systems are described for inferring that an event of interest (e.g., a public gathering, a performance, an accident, etc.) 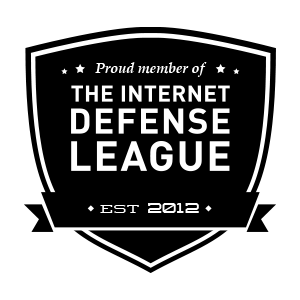 has likely occurred and transmitting a notification of the existence of the event to a particular recipient (e.g., to a law enforcement agency, to a news organization, to a publisher of a periodical, to a public blog, etc.). In an embodiment of the present invention, a computer system determines when there are at least a given number of video clips uploaded to a repository having similar timestamps and geolocation stamps, within suitable thresholds. For example, if 12 video clips having timestamps within 5 minutes of each other and geo-location stamps within 20 meters of each other have been uploaded to a repository, then the computer system might infer that an event of interest occurred at that time and geolocation and transmit a notification to a local television news channel. In one embodiment, after the repository has been processed, the computer system monitors video clips that are newly-uploaded to the repository and, based on their timestamps and geolocation stamps, adds the newly-uploaded video clips to existing groups, or creates new groups. When a video clip is added to a group and the size of the group has reached, for the first time, the size threshold, the computer system transmits one or more notifications, as described above. In one embodiment, an author of an uploaded video clip is asked for permission for the video clip to be considered in the inferring of events. Video clips are included in groups and counted only when the author has granted his or her permission. Embodiments of the present invention are thus capable of providing near-real-time information to pertinent organizations when users of wireless terminals upload video clips to the repository upon being recorded. Moreover, while embodiments of the present invention are described with reference to video clips, embodiments of the present invention also apply to other types of content, such as still photographs, audio clips, and so forth.